Good Morning...and Happy World Card Day (a day late) I wanted to get this card up on the actual day, but I goofed off a bit too much and never made it. I'm liking Flower Soft, can you tell. It's really easy to work with and drying time isn't too bad either. I'm learning as I go and gaining confidence too. 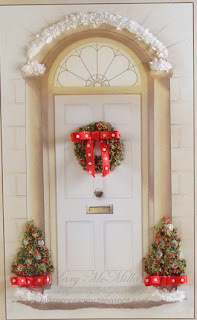 I used the Flower Soft Christmas Traditional Door, which has 6 doors in the package (3 green and 3 white). I used Flower Soft Vintage Christmas for the wreathe and trees, along with Polar White. It has just enough glitter to look like snow. 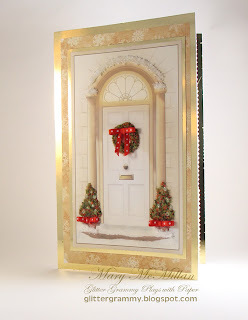 I also used Graphic-45 - Christmas Past Collection - Let it Snow as the background and also as the inside. All of the items used , with the exception of the metallic gold and the ribbon were purchased from Paradise Scrapbook Boutique. She just received her shipment and it's going fast...so, if you're interested in purchasing, she will ship, just give her a call (530-876-8037). Off I go, we are going to friends this morning and my honey is wondering what's taking me so long. Again, Happy World Card Day, Wishing you a wonderful Sunday and a fantastic week. Thank you Leigh. This has been a fun product to work with....and easy....my favorite kind.